Great Baby Stuff Blog: Beware, This Baby Gate Eats Toddlers Hands! Beware, This Baby Gate Eats Toddlers Hands! I needed a baby gate to keep my toddler out of the kitchen (stove is low enough for him to reach hot places, unfortunately), so I went to Wal-Mart and bought the Even-Flo Position and Lock Tall Gate. It was just the sort of baby product I like, cheap ($23), functional and easy to use. I happily set it up and it worked great, toddler stayed outside the kitchen while I worked inside it. He tends to hate being told no, however, even by a baby gate, so his number one goal as soon as it was put up was to get over it. He tried climbing it. The thin wire fencing on it hurt his feet and he soon gave that up, though not without lots of whining and panicking for me to come rescue him half ways up. Giving up the idea of getting over it, he would stand by it and play by it (which was great, I could see what he was doing while I worked) and toss all his toys and sippy cups over it (not so great). Once all his toys were over it, he would holler til I came and tossed them back to him. One time I didn't come fast enough and he started trying to push his hand through the gate to get his stuff. It wasn't easy, but he was getting his little hand through, and just before it went all the way through I grabbed him and eased it back out. This is the bad part about this gate. I imagine tossing things over gates and trying to reach through to get them is a fairly standard scenario that could happen with any toddler. If he would have gotten his hand all the way in, before I got there, it would have been stuck there, and severely bruised on the thin wire fencing by his angry and panicked struggling. Not to mention I don't know how I would have gotten it out. Find some tool in the garage to bend the wires I guess. 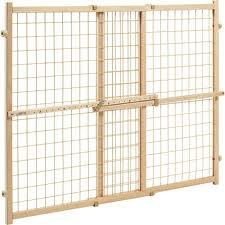 So if you are needing a baby gate, please do not get this one. I don't know what other one would be better, because I have yet to try out any other ones, but don't get this one. Its perfect for toddlers to get their little hands stuck in.